Pat and I were married just a few years before work moved us from Pennsylvania to Florida. Visiting a nearby church, we met Dave and Gloria who invited us to their home and introduced us to another young couple. As the holidays approached that year, Dave and Gloria invited us for Christmas dinner. We were far from home, but people in that church were intentional about making connections. After Dave and Gloria connected us with others, someone invited us to join a newly formed small group. The group was to meet for eight weeks and go through material in a discipleship workbook. Pat and I had never been part of a group like this together, and so we jumped into our first small group experience. We’ve learned a lot about small groups since those early years. Small groups do not replace corporate worship of the church, and the lessons learned in small groups do not substitute for the preaching of the gospel from the pulpit. But small groups perform a vital role in the church as they provide opportunities for members to connect, learn, grow, and minister side by side. Jesus showed us a model of a healthy small group when He called, taught, and sent out his group of twelve. As we develop small groups of our own, here are some ways we can follow the example of Christ with His disciples. Christ offered a personal invitation to each of his disciples. As transplants in Florida, we didn’t seek out ways to get involved. We just showed up at church one Sunday, and Dave and Gloria made it their business to connect us with others. Without a personal invitation, we would have been slow to get involved. Their hospitality, especially at the holidays, taught us how to show hospitality ourselves. Jesus gathered men from different backgrounds to form his small group of twelve. He regularly mixed with people that did not fit the profile of proper religious company. People are naturally comfortable with those most like themselves. But Jesus broke social norms by bringing people together who otherwise would never rub shoulders. Likewise, He gathers people in small groups today who otherwise might never meet—laborers, surgeons, teachers, and stay-at-home moms. We share our struggles and watch God work in our lives. Not only was Christ deliberate about inviting each member of his twelve to follow Him, He was deliberate about teaching them too. The disciples enjoyed fellowship and meals with Jesus, but one of the greatest benefits of being among the twelve was that they could learn God’s word. We hear Bible teaching on Sunday morning in church, and then we get to apply that teaching as we share what we see God doing in and around us. In the midst of our hurried lives, small groups offer us a place of refuge. We miss our time with our small group. We’re eager to get back together each week, and we hate when circumstances force us to cancel a meeting. Small groups are not just for the benefit of the members. They minister to others outside the small group. Our time together prepares us to reach beyond ourselves and join Christ in ministry. 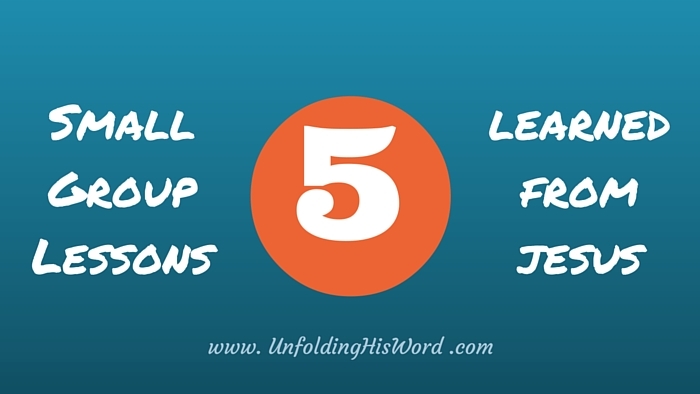 Sometimes this means that one small group must end so that others can begin. We feel nostalgic and wish to recapture the closeness we felt with our original group members, and yet we understand that the purpose of our small group was never just for us—it was to equip us to minister to others. We left Florida years ago, and have lost track of that first small group. Now that we are separated by many miles, years may pass before we get to see Dave and Gloria again. 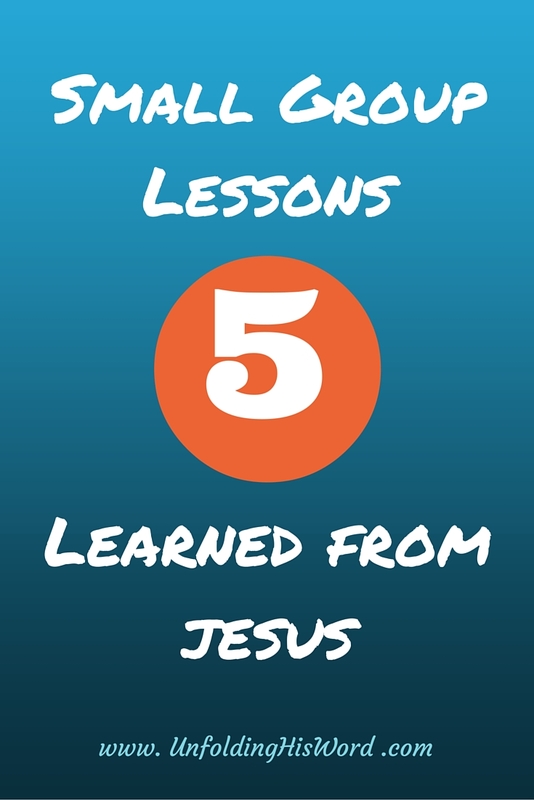 The lessons they taught us have made a lasting impact in our own small group ministries over the years. Pat and I have learned to be intentional about showing hospitality, starting small groups, teaching God’s Word, and being flexible enough to encourage members to move into new ministries when our time together draws to a close. We still have much to learn, but for now, we hope to follow the example Christ left us as He led His small group of twelve.